Welches Mountain Center is conveniently located in the center of Welches, Oregon on Welches Road for business, retail and office space. Post-office, medical offices, and grocery shopping are just across the street. Call 503-622-4275 for business location rental information. Spacious and modern, this complex features a range of floor plans as well as easy Highway access and convenient parking. The Rendezvous boasts good highway signage and visibility, public water and sewer, great auto and RV parking, outdoor seating and display areas, and a nearby nature trail. Contact us or call 503-622-4275 for more info. This spacious restaurant serves full breakfast, lunch, dinners, and cocktails. Open 7 days a week. Come in, relax, and play! Featuring many large-screen TVs, pool, pinball, darts, tournaments, and outside dining. Live entertainment, full lottery and kid’s game room. Delicious breakfast wraps and breakfast sides. Hot and cold wraps, sandwiches, soups and salads. Natural sodas and smoothies – espresso drive-up window. Beer, Wine and Mixed Drinks. Dine-in, take-out, drive-up window or patio service available. Wedding and special even catering. Nestled among the trees in the foothills of Mt. Hood is this unique setting – 2 stages, horseshoe pits, patio seating for 50, and a safe, fenced, grassy area for families to enjoy the beauty of the Oregon outdoors, listen to live music, enjoy great drinks and amazing food with good friends! Store your extra belongings, furniture, cars, boats, inventory, valuables, recreation gear, tools and more! 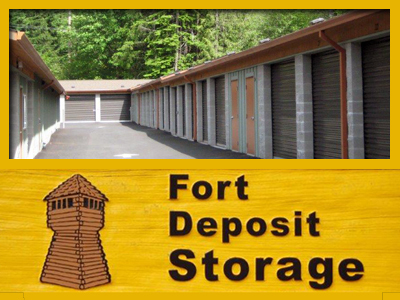 Fort Deposit Storage also rents spaces to retail and wholesale businesses. 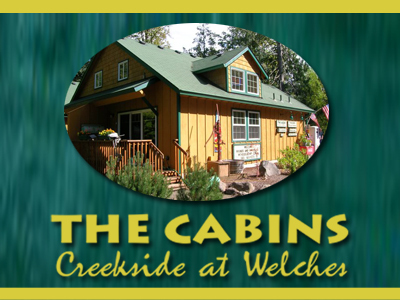 Contact Welches Mountain Properties or call 503-622-4275 for more information.